“I’ve read the book twice now. I really enjoyed the back stories that Jason created for these people. The Book of Mormon is a very condensed collection of books from records kept by people who really did live in the ancient Americas. Like all people, these were just as human as we are, including weaknesses and strengths. We don’t often see the weaknesses in their characters when we read the scriptures due to the need of them being so condensed. I liked how Jason wrote, using his own life experiences in the military, to show what possible weaknesses were overcome to allow each of the real people we know of from the scripture account become the heroes they were. Especially Captain Moroni, who has always been a favorite of mine. When I read the war chapters in the Book of Mormon, even the account of the Jaradite wars leading to their ultimate destruction, I’ve always wondered about their back story to fill in the blanks. I love what Jason has done by writing down how he envisioned Captain Moroni’s backstory could have been, and with incredible illustrations to help the story by a very talented artist. The most amazing story and posters to hit me and my kid’s lives!! LOVE the entire idea behind it all. Thank you!!!! I had such a fun time explaining Moroni in more detail to my children than ever before. It’s inspiring! “I am very impressed and I don’t impress easy when it comes to military novels and military history. I was able to put faces and personalities to the heroes of the Book of Mormon. The pages keep turning and turning. “I bought this book for my father for his birthday. He is an 84 year old, slow reading , salty Marine combat veteran of the Korean war. He devoured this book in a two day reading marathon. He loved recognizing all the military strategies he learned during his experience in combat school, that had never been used in Moroni’s time, being used by this courageous young captain.. This young man, because of his humility and willingness to listen to others, was using willing to use strategies that were never used in battle before. As a matter of fact, if either the leaders of the North or South had read the Book of Mormon and followed the tactics of young Moroni, countless number of lives would have been spared in the Civil War. 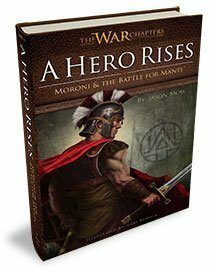 Ready to find out for yourself more about the heroes of the War Chapters and how you can apply these amazing examples to your everyday life? Click the link below to visit our store.